The music of Tchaikovsky is beloved by many. For an audience of classical music aficionados, an evening of Tchaikovsky needs little explanation. But Grand Rapids Symphony Music Director Marcelo Lehninger provided one anyway. “He’s one of my favorite composers. I love his music,” Lehninger said on Friday in DeVos Performance Hall. But the Brazilian-born conductor had more to say on the subject. “One of the things I love about this orchestra is its passion,” he said. That’s the reason for the Grand Rapids Symphony’s all-Tchaikovsky concert on Friday, Jan. 12, and Lehninger hinted that symphony goers will see more of the same in the next two seasons. If this weekend’s concerts are any indication, buy your tickets as soon as they’re available. Grand Rapids Symphony’s evening of Tchaikovsky on Friday was amazing. Tickets remain available for the concert in the Richard and Helen DeVos Classical series, which repeats at 8 p.m. Saturday, Jan. 13. 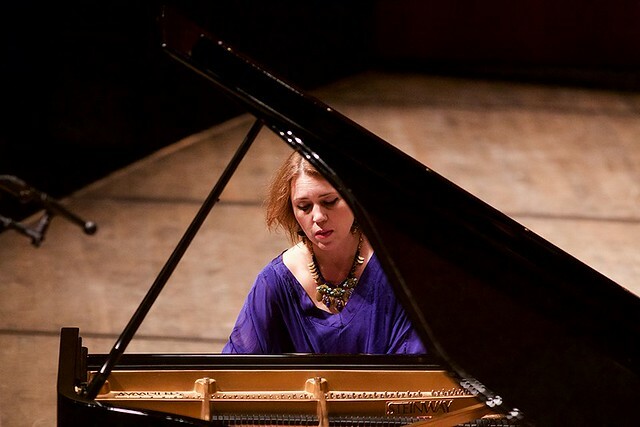 Pianist Gabriela Montero, appearing in Grand Rapids for the first time, joined the Grand Rapids Symphony for Tchaikovsky’s famous Piano Concerto No. 1 in B-flat major. It’s the piece that Van Cliburn played in 1958 at the inaugural Tchaikovsky International Piano Competition, making the lanky Texan a household name and his subsequent recording of the concerto the first classical music recording to sell 1 million copies. It has everything from crashing chords to delicate melodies. Pianists who play it are forces to be reckoned with. Those who play it well are true artists. DeVos Performance Hall was treated to a true artist, capable of caressing the instrument much as a lover would as well as hammering it as a blacksmith should. The Venezuelan pianist plays with presence and authority. She doesn’t dominate the performance, apart from her first movement cadenza, which held the audience in rapt silence. The lengthy first movement ended with sustained applause. Purists would call that a faux pas on the part of the audience. True music lovers would say it’s an honest and heartfelt expression of emotion. Performing Tchaikovsky well is all about passion and precision and knowing which to apply and when. Montero brought passion came to the fore in the lovely lyrical melodies, and she delivered precision with powerful octaves and thundering chords. In all, it was sublimely romantic and thrilling in equal measure, leading to a lengthy standing ovation. Nor is it always as much fun as what was to come. Montero is a celebrated improviser who takes musical suggestions from the audience and then makes music on the spot. Same as Bach, Mozart and Beethoven once did. “I love the fragility of it,” she told the audience. Someone shouted out “Happy Birthday,” and Montero was off to the races. Beginning with a bit of Bachian counterpoint, she soon segued into classical era clarity. A series of key changes and a sudden mutation to a minor key led to a passionate romantic flavored variation in which the melody slipped into the background. Montero followed that with modulation back to the major and a rollicking ragtime stride piano as Scott Joplin might have played it in the bars and bordellos of New Orleans. Lehninger returned in the second half with Tchaikovsky’s Symphony No. 5, a uniquely cyclical symphony with a theme that appears in all four movements of the 50-minute work. Some describe that theme as fate, beginning somberly at the beginning of the work but ending triumphantly at the end. Lehninger began a little hesitantly, and then took off like a shot. The opening movement was delightful, well-sculpted and sensible with hints of wild abandon yet to come. Principal hornist Richard Britsch was superb with the memorable horn solo in the second movement with rich string accompaniment. The woodwind section was outstanding with the third movement waltz. The finale is one of those aggressive, take-no-prisoners moments in classical music, full of dramatic climaxes and earthshattering resolutions. Tchaikovsky fretted that he went too far over the top. But it’s also an opportunity for an orchestra to show what it can do. In the capable hands of a conductor such as Lehninger, the Grand Rapids Symphony gave a full-bore performance that made the piece sound fresh and made your heart pound with excitement. That’s a wonderful thing. The concert opened with the Polonaise from Tchaikovsky’s opera Eugene Onegin. Lehninger conducted it like a kid in a candy store with plenty of cash in his pocket. He was having a blast. So was the audience.